Here is an overview of what goes into good vocal delivery of any kind of speech or talk, including a homily. I will expand each point in later posts. Audibility. Every word you speak should be understandable. You achieve this by adequate volume and articulation of each syllable. Eye contact. It is important to look up regularly from your notes at your audience. Only words or silence. Don’t fill your homily with ums and ahs. Vocal variety. Whether or not you know it, you have a default level of volume, speed, pitch, and tone. Without varying these prudently, your deliver will be boring. If you go overboard, however, your homily will be silly or stupid or embarrassing. You job is to put vocal variety to use as the words and occasion demand. Volume. Louder up to a shout or quieter down even to a whisper. Speed. Speed your speaking rate up or slow it down. Don’t be afraid of a dramatic pause. Pitch. Raise or lower your normal pitch as the words demand. Tone or emotion. Depart from your default emotion to convey other emotions like anger, sadness, excitement, friendliness, and so on. Vocal variety pertains to individual words, phrases, and even sentences. 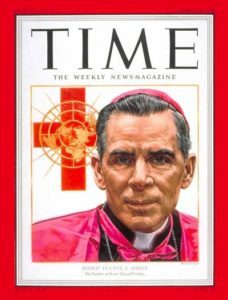 If you doubt these points, listen to Fulton J. Sheen, Winston Churchill, or Martin Luther King, Jr.